New report concludes state department is ineffective in permitting companies that handle hazardous waste. 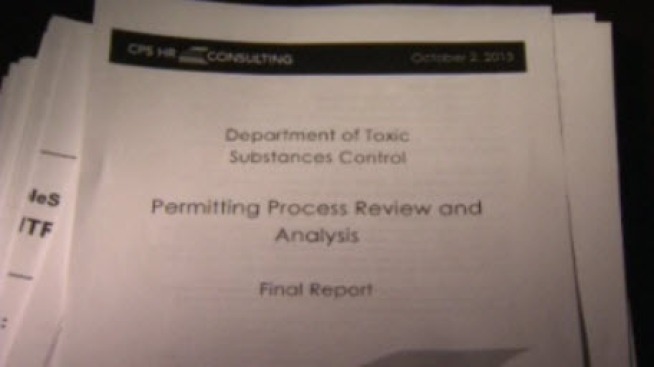 The Department of Toxic Substances Control has failed to establish clear guidelines for its permitting process for companies that deal with hazardous waste, according to a new review released Tuesday by consulting firm California Personnel Services. Permitting renewals take an average of 4.3 years from start to finish. In some cases — the process took longer than nine years. In February, DTSC director Debbie Raphael issued a letter to staff informing them that 22 out of 117 — or nearly 20 percent — of hazardous waste facilities that treat, store or dispose of hazardous waste are operating with outdated permits. Those 117 companies handle 1.8 billion tons of hazardous waste each year in California. The state toxics regulator is responsible for protecting the environment and the health of Californians. Formally articulate the objectives and purposes of the Permitting Program…to be approved by Cal‐EPA Secretariat and the relevant Legislative Oversight Committees. Critics have long complained about what they call “lip service” by department leaders and have criticized them for failing to revoke the permits of companies that continue to break environmental laws. They point to Evergreen Oil in Newark as a serial polluter with a history of leaks, spills and explosions. Evergreen declared bankruptcy in April, and on Sept. 24 — one week after new parent company Clean Harbors took control of the facility — the company experienced another 75-100 gallon oil spill. The Bay Area Air Quality Management District said the agency is considering whether to issue Evergreen yet another violation. When asked why Evergreen has not received significant sanctions for being a serial polluter, Raphael said that the company is under “careful scrutiny and careful attention” by department leaders. “When you look at a company like Evergreen it is a complicated industrial setting where you have a number of agencies looking at and making sure that [the company] is coming into compliance,” Raphael said. The Southern California-based hazardous waste recycler Phibro-Tech has also come under fire by residents in Santa Fe Springs for operating under a permit that expired 16 years ago. According to DTSC regulations, permits are grandfathered-in and valid until the agency makes a decision to renew them. The company has said that the department issued Phibro-Tech a draft permit in 2010 and that the company is working with the DTSC to renew the permit. Have a tip for the Investigative Unit? Email theunit@nbcbayarea.com, call 888-996-8477 or contact reporter Vicky Nguyen at Vicky.Nguyen@nbcuni.com or elizabeth.wagner@nbcuni.com.